On June 4 Mitsubishi Heavy Industries, Ltd. (MHI) delivered the cargo-passenger ship "Tachibana-Maru" to Tokai Kisen Co., Ltd. at its Shimonoseki Shipyard and Machinery Works, the Company said Wednesday in a press release. The vessel is a "super eco-ship" with a high-efficiency propulsion system that achieves outstanding energy savings, environmental load reduction, and enhanced passenger comfort and safety. 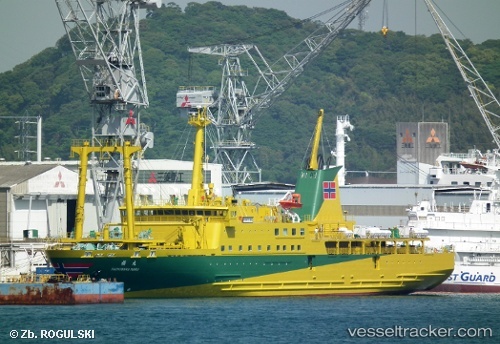 The ship also features a fresh new color scheme of yellow ocher and olive green designed by Ryohei Yanagihara, a well-known Japanese illustrator who is also an honorary captain at Tokai Kisen. The cargo-passenger ship measures 118.0 meters (m) in length overall (LOA), 17.0m in width, and 8.95m in height (5.40m in draft). The 5,681 gross tonnage vessel has a service speed of 19.0 knots per hour (about 35.2km/hour). MHI began construction of the ship in March 2013 and launched it in November of the same year. The ship will be put into service on the route between Tokyo and the Izu Islands on June 27, 2014. The ship employs a tandem-hybrid contra-rotating propeller (CRP) propulsion system developed by MHI. The system is comprised of single-shaft propulsion propellers driven by low-speed marine diesel engine and electric-drive azimuth propulsion propellers that enable the direction of propulsion power to be freely changed. In comparison to conventional twin-shaft propulsion systems, the new system enables less appendages for propulsion systems such as skegs, shaft brackets and rudders and reduces water resistance, and improves energy-saving efficiency by allowing the use of only fuel-efficient low-speed diesel power in bays and channels where slower navigation speeds are required. The new propulsion system enables the Tachibana-Maru to achieve 15.6% higher fuel efficiency than the "Salvia-Maru," a cargo-passenger ship built by MHI and currently in service at Tokai Kisen.